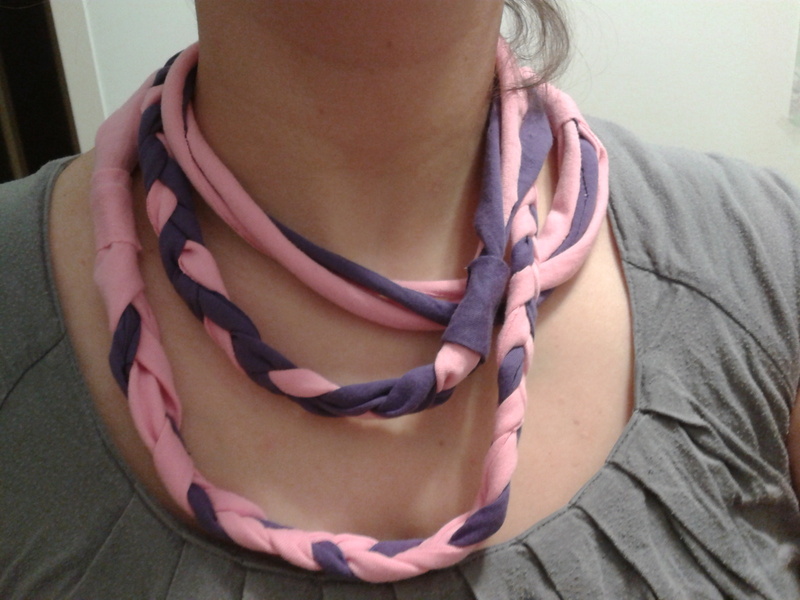 It’s not quite a tshirt scarf, as I only used 3 strands of fabric (I didn’t have more of the purple, and did not want the pink to take over the whole thing), so it’s more a necklace. But yay, I did it! I’m not sure if I’ll give away this necklace/scarf, or if I’ll make another one to make a gift. 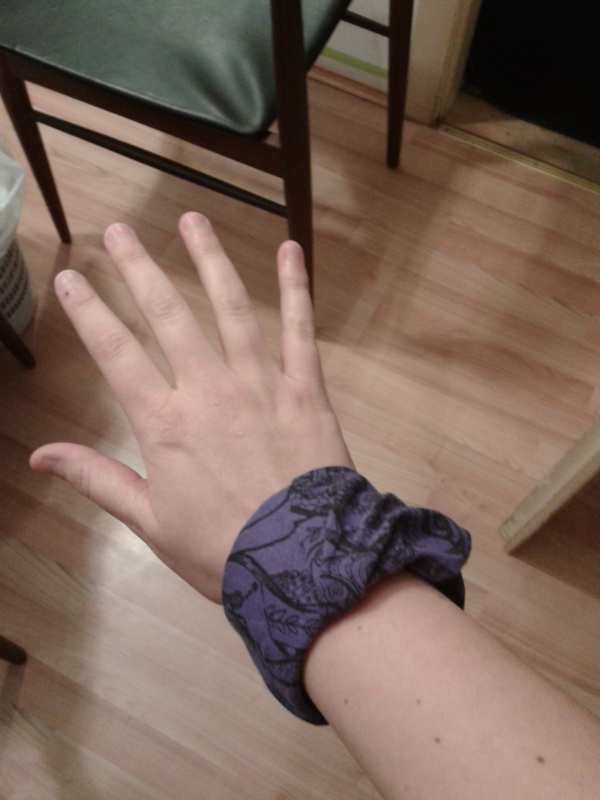 One of the things I’ll use for the PIF for SURE are fabric bracelets. The original idea I found on the internet was to use waterbottles, and lots of duct tape to make the ring stable and then wrap fabric around and fix it with a glue gun. I really don’t like the idea of using loads of tape just to make a bracelet, so I decided to use a certain kind of chips wrapper (yeah, the tubes) instead. They are pretty stable on their own and have the perfect cirumference. My first try took about 15 minutes, including tearing apart an old tshirt that I loved big time. Wearing it often, though, made it pretty used up under the arms, and with those stains, not even a 2nd hand shop could have used it. Of course, I did not take a picture of the original tshirt … sorry for that. Pay it Forward 2013 I promise to make something handmade for the first 5 people that comment on this post AND repost it on their own status. I promise to make (and send) something handmade by the end of 2013. It doesn’t matter what it is so long as it is handmade (e.g cake/cupcakes, arts, crafts, etc.) Let’s spread the crafting love !!! I liked it on the second person’s page I saw it on, and posted it on my own. Four people actually liked it on my page, so now I’m kind of struggling with plans on what to do for them. My upcycling/craft skills are still pretty low, so it will have to be easy things. I started to try some easy upcycling methods just before Christmas. 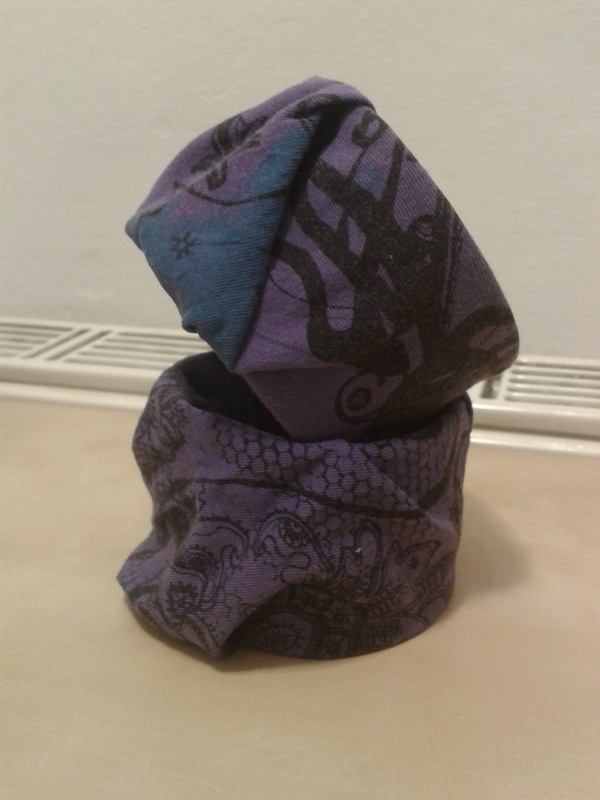 Having seen some interesting and lovely pieces of handicraft, I decided to try sewing a grocery bag out of an old tshirt, fixed a small hole in a knitted sweater, and even managed to sew two small doggies out of an unused scarf. But this Monday, everything got a bit bigger: I bought a sewing machine. The offer (100 euros for a Singer machine) came right at the perfect time, so I took the opportunity … and at some point this weekend I’ll go raid IKEAs textiles department! !